Music in the Park Features the Shrine Jazz Band on Sunday, July 30 at 7 pm. Join the Shrine Big Band Jazz on Sunday, July 30 at 7 pm in Pastime Park, 344 North Chillicothe Street. Plain City’s Music in the Park continues their season with this wonderful Free concert that will feature Big Band and Swing Music provided by the Shriners. July 30, Sunday, 7 pm, Shrine Big Band Jazz. August 6, Sunday, 7 pm, Lower London Street Dixieland Band, featuring 1920’s and dixieland music. August 13, Sunday, 7 pm, Emerald City Swing Orchestra is Central Ohio’s premier Big Band and is regularly featured at the Emerald City Ballroom for dance sessions. August 27, Sunday, 7 pm, Trombone Plus will delight the jazz enthusiasts with trombones, drums, brass, and a piano. September 10, Sunday, 6 pm, Shrine Concert Band will perform patriotic and family oriented music. September 3, Sunday, 6 pm, Rain date for performances cancelled previously due to the weather. For more information and the remaining schedule for the rest of the summer, you can also visit the Village of Plain City’s web site HERE. Support Your Bones, Support Yourself. By Our July Student Pharmacist, Kevin Wenceslao. Our bones are responsible for many functions. They are the framework for our bodies, providing support. They protect our organs, allow us to move, and even produce red and white blood cells which help provide our bodies with oxygen and the ability to fight off infections. Unfortunately, over time or without proper care, our bones can weaken, which can lead to a disease called osteoporosis. Osteoporosis occurs when the body loses too much bone and becomes frail, which can lead to painful breaks or fractures. Fortunately, there are ways to take care of your bones to prevent this condition and also ways to manage your life if you have weak bones. Osteoporosis is a common type of bone disease. Our body maintains a balance between breaking down old bone and making new bone. If this balance is disrupted, and we lose too much bone, this leads to osteoporosis. Unfortunately, as we age, our bones sometimes break down more than we can create, which leads to a natural loss of bone as we get older. If we do not take proper steps to maintain our bones, we can become more susceptible to developing osteoporosis. A bone density test conducted by your doctor can help diagnose osteoporosis and determine how severe it may be. In some cases, the doctor may order specific bone medicine in order to help the bones. Gender: Women are at higher risk than men due to smaller bones and hormone changes during menopause. Ethnicity: White and Asian women are at greater risk than other races. Family history: People with family members who also have osteoporosis or a history of fractures can be at risk. Diet: Low calcium or Vitamin D supplementation from your diet contributes to greater risks. Physical activity: Getting too little exercise or having an inactive lifestyle also increases your risk factors. Alcohol: Drinking can increase your risk of developing bone disease, as well as falling and breaking your bones. Body Weight: Being underweight can lead to frailty. Smoking: Cigarettes can cause early menopause and prevent your body from utilizing calcium properly which leads to earlier development of bone disease. Medications: Some medications can cause bone loss such as glucocorticoids, cancer treatment medicines, and seizure treatment. It is important to discuss the risk/benefit of your medications with your doctor if you are concerned. Diet is a key factor in keeping your bones healthy. It is important to have your calcium and Vitamin D levels regularly checked at your doctor’s visits. 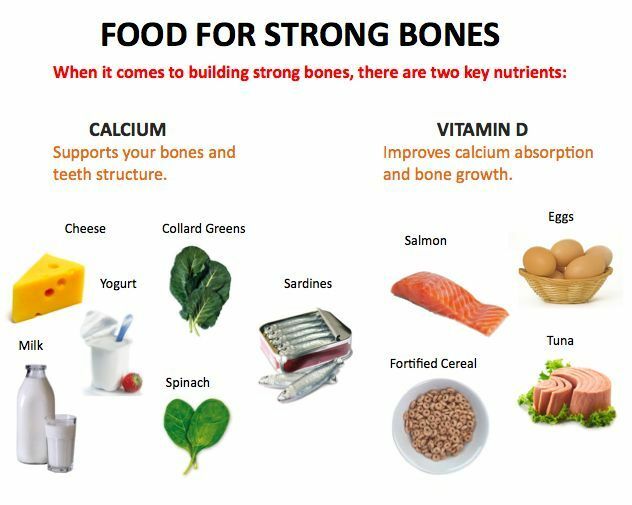 Many foods can be good sources of calcium and Vitamin D. Calcium is an important mineral that is necessary for your bones and teeth. Calcium can be found in most dairy products. Vitamin D is found in small amounts in food, but most of it is provided by getting enough sunlight. If diet is not enough or not an option, your doctor may recommend getting over-the-counter Vitamin D and calcium supplements. At Plain City Druggist, we offer a wide variety of supplements in different strengths to meet your daily needs. These supplements can come in a multiple forms ranging from traditional tablets to chewable gummies and liquids. Ask your pharmacist for more information next time you come visit. Daily intake of Vitamin D and calcium can vary depending on your age, current health condition, or diet. It is possible to get too much calcium and Vitamin D, so it is important to consult your doctor to determine your individual needs. The chart shown below represents recommended daily intake and maximum intake for an average person. By adjusting your daily lifestyle, you can reduce your risks of developing bone disease. Even if you already live with osteoporosis, taking these steps can help prevent it from getting worse and ultimately prevent falls and fractures. Sharing this information is a great first step in helping yourself and those you care about. Stay Cool and Stay Hydrated. By Our July Student Pharmacist, Kevin Wenceslao. This past week alone, the average temperature was 84℉ with the humidity around 97%. Not only does the high temperature and humidity lower the air quality, these factors also put many people at risk for dehydration and heat-related illness. According to the Centers for Disease Control and Prevention (CDC), around 618 people in the U.S. are killed by extreme heat each year despite the fact that heat-related illnesses and deaths are preventable. By understanding the warning signs of dehydration and learning how to treat and prevent those symptoms, we can help reduce the number of heat-related incidents. 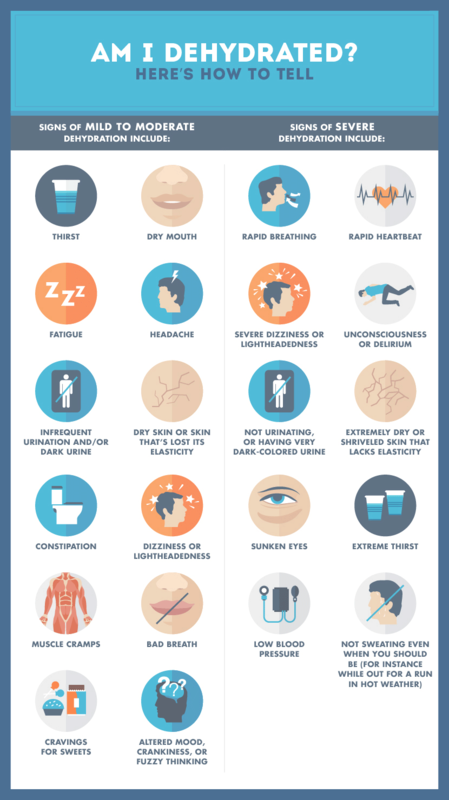 In order to recognize if someone is dehydrated, there are symptoms that you can watch out for. The best way to treat dehydration is with fluids. Mild dehydration can often be self-treated by drinking water, sports drinks, or rehydration liquids such as Pedialyte, which all can be found here at Plain City Druggist. If symptoms continue or worsen over a few days, it is important to call your doctor to get help. In cases of severe dehydration, people are given intravenous fluids through an IV at the hospital. In summers like these, the extreme heat makes us more prone to dehydration. Not only does the hot weather directly increase our body temperatures, but it also causes us to sweat profusely and lose water more quickly. Sweating is an important cooling mechanism for the body. As the water droplets evaporate from our skin, they also take away heat. When we are dehydrated, we lose that ability to produce sweat and cool ourselves down. If the body’s core temperature is too high, the vital organs and brain can be damaged, which leads to heat exhaustion, and, in extreme cases, heat stroke. In these severe cases, it is important to cool the affected person down and get the appropriate emergency help. Fortunately, dehydration is a preventable condition. Proper hydration is key, and it is important to drink throughout the day even if you’re not feeling thirsty. In hot weather or during times of physical activity, you should also drink more than you think is actually necessary. Staying cool is also a great way to avoid dehydration. Stay indoors and avoid doing outdoor work during the hottest parts of the day from noon to 3 PM. If being outside is unavoidable, make sure to wear a hat and loose-fitting clothing, apply sunscreen, and plan frequent breaks to drink water and cool down. More importantly, certain people are also at greater risk of dehydration and of developing heat related illness. These include older adults over the age of 65, people with chronic medical conditions, children, and infants. Keep a close eye on friends and family during these hot and humid days, and encourage each other to stay cool and stay hydrated. If you have more questions, the CDC website is a great place to visit for tips or pop into our air-conditioned pharmacy to talk to your local pharmacist! “Rally in the Alley” During the “Dawg Days” of July and Watch The Reaganomics “Rock the Clock,” too! If you are looking for a way to enjoy the summer heat instead of loathing it, there are some fun activities in Plain City on Friday, July 21 and Saturday, July 22 to take your mind off the hot weather. First off is The Dawg Daze Festival on both Friday, July 21 and Saturday, July 22 in Pastime Park. from 12-6 pm on Friday and 10 am to 6 pm on Saturday, check out flea market vendors, as well as crafts artists, and antique dealers. Additionally, there will be carnival rides on Friday from 3-9 pm and on Saturday from 12-9 pm. The Grand Parade through downtown will take place at 2 pm on Saturday, July 22. Chris Clark, from Jan and Tony’s Pizza, is generously awarding $100 to the best float, display, or artistic endeavor in the parade. There will also be an award of $50 to second place and $25 to third. All kids participating in the parade (either on floats, bikes, or little cars) will receive a special prize just for being involved. Please be at the north entrance of Pastime Park at 1:00 pm if you plan to be in the parade. Line up begins at 1:30 pm. Admission to Pastime Park is free. The Dawg Daze Festival is being sponsored by The Plain City Events Committee. The Rally in the Alley behind the Ol’ 42 Grubhouse, 138 West Main Street, will feature food, music, beer, and wine, as well as giveaways from 5-9 pm on Saturday, July 22. Jordan Ranly will be the featured musician. The music usually gets underway around 6 pm. There will be a final Rally in the Alley on Saturday, August 19 with Byrd Manning providing music. UPCO is sponsoring the Rally in the Alley Saturdays each month during the summer to bring people in to uptown Plain City. To find out more, visit the Ol’ 42 Grub House web site HERE or the Uptown Plain City Organization (UPCO) web site HERE. Additionally, Pioneer Pizza will be featuring a “Rock the Clock” event on Saturday, July 22 from 6-11:30 pm. For the location of “Rock the Clock,” see the map below (intersection of 161 and Chillicothe Street). From 6-7:30 pm, The Scott Hunter Band will perform. From 8-11 pm, The Reagonomics will take the stage. This event is being sponsored by Pioneer Pizza, Honda Marysville, Impact60, and the Ohio Premier Soccer Club. Plain City will be filled with music and laughter on Saturday thanks to the Ol’42 Grubhouse and Pioneer Pizza. Unused, Unwanted, and Unsafe: What To Do with Old Medications? By Our July Student Pharmacist, Kevin Wenceslao. Do you have unused medications sitting around in your medicine cabinet? Are you afraid that a family member or loved one might accidentally take or use that medicine? Do you know how to properly dispose of those medications? For this week’s topic, Plain City Druggist is here to explain why it’s important to get rid of old prescription medications and to also educate on how to dispose of them properly. To start off, there are a number of reasons why people may have old medications laying around. Medications are often stopped or changed for a variety of reasons: allergic reactions, side effects, or lack of effectiveness. Other medicines, such as painkillers or rescue inhalers, are taken only “as needed” and may not be completely used up by the time they expire. Someone in the family may have died and other family members are not sure what to do with those medications. In any case, holding on to these old medications can lead to problems such as overdose, accidental poisoning, or even drug abuse. Medications do not last forever; all medicine has an expiration date. Typically, all prescription drugs have a “discard by” date on the label, and over-the-counter (OTC) medications have an expiration on the original container. After a drug expires, it can lose effectiveness or become harmful. Simply having an expired medicine in your house can increase the risk of you or your family member taking it by mistake which could lead to accidental poisoning. If you are ever unsure if a drug is expired, don’t hesitate to call your local pharmacist at Plain City Druggist to ask. Another potential hazard of keeping unused medications, especially controlled substances like opiates, is the risk of misuse and abuse. The Food and Drug Administration (FDA) mentions that studies have shown that many abused prescription drugs are often obtained from friends and family. These drugs are easily accessible because they are commonly kept in a place like the medicine cabinet where they can quickly be found. The potential for abuse is why it is important to discard any unused medicine when you no longer need it. By getting rid of these drugs in a proper manner, you can help prevent abuse. So now the question is, how do I get rid of these old medicines in a safe and responsible manner? Luckily, there are a number of options available for you right here in Plain City. First and foremost, if you ever need help with disposing of a medication, Plain City Druggist is a great place to start. We are always happy to answer questions and provide information about local drug take back facilities and programs. Every year, Madison County hosts a Drug Take Back Day in April. This event serves to educate the public and encourage the community to bring back expired, unused, and unwanted prescription medications. Furthermore, this process is anonymous and no questions will be asked at the event. If these options are not accessible to you, there are also ways to dispose of medicines at home. In order to prevent harming others or the environment, and to reduce the risk of abuse, there are specific instructions when it comes to disposing of medications at home. Mix the medicine with unpalatable substances like used coffee grounds, kitten litter, or dirt and placing it in a sealable container before throwing it out in the trash. The original bottle should be thrown away separately with all the information scratched out. Some medications are especially harmful if taken by mistake or have a high potential for abuse, and the FDA actually recommends flushing these medicines down the toilet to reduce those risks. Click HERE for the FDA list of medications that should be disposed by flushing. As you can see, keeping expired, unused, or unwanted medications in the household can lead to many problems. Proper disposal of these medicines can help keep you and your family safe. In addition to having a local pharmacy like Plain City Druggist as a resource, the FDA website also has great sources with more in-depth information about drug disposal. As always, if you have any questions, feel free to come in to the pharmacy to ask! Center for Drug Evaluation and Research. (n.d.).